Collaboration and SharePoint are two of my favorite topics. I’m following them for the last couple of years. In one of my very early posts on PLM Think Tank I wrote about SharePoint PLM Paradox? Microsoft SharePoint 2007 business model made it very successful. Technology was decent and I’ve seen many customers and business partners are making success with SharePoint deployment and development. I saw a definite potential for SharePoint to enrich PLM experience from both technological and user experience side. However, I don’t see the roadmap towards SharePoint success in CAD/PLM business as something simple and straightforward. Different vendors in CAD, PDM and PLM spaces are targeting differently SharePoint. Earlier this year I put some of my thoughts about PLM and SharePoint in the following post – PLM and SharePoint: Business Together? The SharePoint roadmap was bumpy for some of the vendors, and I shared my view on PTC’s, SharePoint and ProductPoint Retirement. Navigate to the following link to learn more. SharePoint 2010 – even more collaboration? Microsoft announced SharePoint 2010 almost two years ago. The new version of SharePoint put additional focus on business aspects of SharePoint integration within enterprises. Content type management, BCS, Lists, Web Parts, Workflow – this is only a short list of enhancements and topics Microsoft was focusing on in SharePoint 2010. I put some of my thoughts about the Sharepoint 2010 path in PLM back in September 2009. Navigate to the following two blogs to read more: SharePoint 2010 Communities and PLM Social Demands and SharePoint 2010 for Collaborative Product Development Applications. In my view, Autodesk stayed neutral with regards to SharePoint long time. It doesn’t mean Autodesk products didn’t provide some support for SharePoint. Nevertheless, I haven’t seen SharePoint as a strategic option for Autodesk. Autodesk Vault, provided set of technologies and tools for product data management (PDM) and collaboration. The solution takes advantage of features and functionality provided in SharePoint 2010 and Autodesk Vault 2012, giving SharePoint 2010 users direct access to engineering and design data within Vault, including search and navigation, and the ability to view and print design data.… SharePoint 2010 users now have direct access to building information modeling (BIM) and digital prototyping data within Vault and can incorporate it into existing enterprise data, tools and processes. In addition, the press release release is talking about technologies such as social computing, federated search, Microsoft Web Services and Microsoft SQL Server. Let me make some observations. 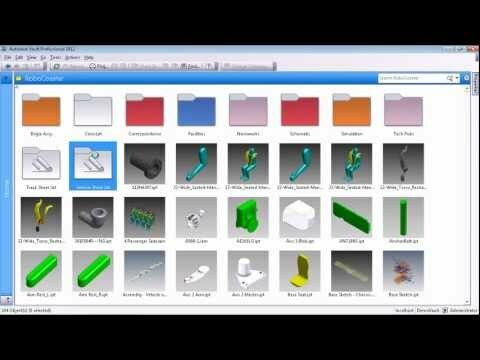 Autodesk is highlighting some changes in Autodesk Vault such as “a project oriented UI” and process orientation. The presented scenario shows collaboration in the context of engineering change order. This is one of the most popular scenarios presented by mainstream PLM vendors in the context of design and engineering collaboration. Huh… Autodesk is moving to PLM? This is not a new topic. Almost a year ago, I posted – Autodesk, Data Management and “Why PLM?” topic. There is no consensus about Autodesk PLM move in the industry community. In my view, PLM move will not be an easy jump for Autodesk. Recently, I can see some changes in Autodesk PLM orientation. During the recent meeting with Autodesk Management, Carl Bass, Autodesk CEO made some interesting statements with regards to Autodesk and PLM strategy. You can listen to Carl’s talk and see presentation by navigating to the following link (you will have to register and leave Autodesk you email address to access this link). Technological aspects of SharePoint integration with Autodesk Vault is another interesting question. Since I wasn’t able to find any published information about that, I can only guess and rely on Autodesk video, Microsoft SharePoint technology and architecture slides. SharePoint is a technology and platform. SharePoint platform contains lots of benefits for every company running Microsoft stack and, in addition, has lots of bells and whistles. Many enterprises are running their collaborative efforts and content management projects using SharePoint. At the same time, in order to be successful, it requires consultancy, consultancy and again, consultancy. It is important to estimate the cost of free SharePoint. Deployment is another aspect of how SharePoint option will play for Autodesk customers. Read the following blog – PLM and SharePoint Scalability to get a glimpse of the idea. SharePoint can be a powerful tool, but it requires an appropriate planning. What is my conclusion? My hunch, Carl Bass anti-PLM rap statement is probably outdated. PLM ideas have some roots in the ground. PLM mindshare vendors are selling PLM solution, and Autodesk is asking themselves a question what alternative to put in front of PLM collaboration and Top Down single point of truth. Bridging SharePoint and Autodesk Vault is a step towards trying to find that solution. Autodesk MLP hardly can be considered as an option. There is probably a better option. Autodesk needs to figure out how to develop that. Interesting time… Just my opinion, of course. YMMV.